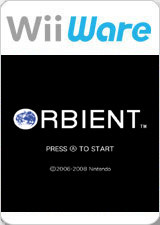 Orbient, known in Japan as Orbital, is a puzzle video game developed by skip Ltd. and published by Nintendo for the Wii's WiiWare digital distribution service. It is one of seven games in the Art Style series of video games available for WiiWare and DSiWare. It is a remake of a Japan-only Game Boy Advance video game titled Orbital, released for the bit Generations series of video games. The graph below charts the compatibility with Art Style: ORBIENT since Dolphin's 2.0 release, listing revisions only where a compatibility change occurred.